For the advanced collector or professional exhibit, we have large pieces of Titanic fabric or wood, some in Lucite holders. These truly spectacular relics are some of the rarest, most valuable and highly sought after collectibles in the world. Hidden in private collections for over 85 years, Titanic enthusiasts, collectors, museums or business owners are not only given the chance to view them for the first time but can actually own a large significant piece of world history. According to Guernsey's the red fabric is one of the few pieces that can be traced back to the original owner (so can most of our others). Provenance or documentation is everything which dramatically increases the value and these pieces have it! Most of the items shown have previously been displayed in one or more museums. Each will come with Certificates of Authenticity, several documents and photographs detailing the 1st tier provenance to the original owner. Authentic wreckwood from the Titanic is available and priced about $600 a gram. 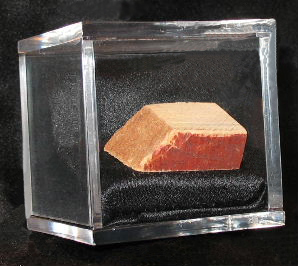 The large block piece shown (approx 3cm x 1.9cm x 1cm) weights about 2.5 grams and sells for $1500. Compare this to a piece "half this size" that sold for over $1,000 in a 2005 auction. These particular pieces are made of pine indicating the high probability it was deck wood, possibly from the breaking point before it sank...Wow! Pages of formal documented proof to the original owner and COA is included, which is why many have been sold! Felt fabric "purported" to actually have been on the Titanic / 2" x 2" - $500. COA's and copy of a direct descendants letter included. Larger pieces available upon request.